in-between, Parlor will have you ready to take on the world in style. At Parlor, we believe beauty should be approachable, not intimidating. Parlor Beauty Bar is Austin's Premiere One-Stop Styling Lounge. From blowouts, and makeup to lash extension and everything in between, we’ve got you covered. Jessica is fabulous. I have pretty frizzy dense hair and she was able to tame it down to some gorgeous waves. She was very diligent in figuring out exactly what I wanted and made sure to consider the smoothing treatment in my hair and use the correct products so as to not ruin it. The salon itself is fantastic, too. Everyone was super nice, the decor is trendy, and the hair wash station was really comfortable. 10/10 would definitely come back. Step 1 of picking a beauty salon is to go somewhere that feels beautiful. Parlor Beauty Bar nails this. It's so gorgeous. I have nice lashes naturally (#blessed) but when Parlor ran a special on eyelash extensions, I decided to go for it. My main concern was harming my natural lashes because I knew I couldn't afford to make this a forever beauty treatment. Megan was fantastic at explaining her approach to extensions and how they work so I felt really comfortable. The result was amazing. She warned I would get addicted. She was right. I loved them!!! The friendly staff, cute environment, and quality services keep me coming back! Great find! I recently visited Parlor for the first time and my experience was 10/10! Everyone was so friendly and provided great services. Also, the overall vibe and aesthetic of this salon is by far the most instagram worthyI got a makeover by Brittany and loved the fall look she gave me! She was so friendly and also educated me on her favorite cruelty free and high quality make up brands! Absolutely loved my experience here!! I got a blowout and Liz made my hair look absolutely gorgeous. Totally impressed with their work!Also loved that everyone was super friendly and that the place is SO cute. The whole thing is filled with cute designs and wallpaper. Loved it!Definitely recommend heading here if you want a blowout, and they do nails, makeup, etc too so I'll be back for that! I had my eyebrows tweezed here by Kristina. She did an amazing job! I have sensitive skin and didn't break out at all. She even made the shape better then I had! The space is so cute and well designed. Everyone is super friendly and welcoming 🙂 Will definitely be coming back for regular maintenance. I just had my fourth blowout at Parlor Beauty Bar (with Jessica) and look forward to many more. It's such a treat to walk into the bright and cheerful, yet calming atmosphere, to a friendly greeting and drink offer. The owner has considered everything...From the most comfortable wash bowl I've ever encountered (and that includes a LOT of variety), to the efficient and orderly blowout bar, and the separate rooms for other services, Charlotte has covered all the bases. She is clearly selective when it comes to her choice of staff as well. 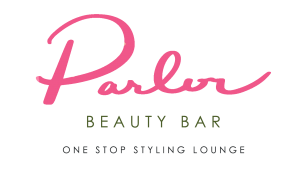 If you want to treat yourself to some pampering, you can't go wrong with Parlor Beauty Bar. Subscribe and get access to exclusive promotions, offers and events!